It’s another breezy morning at the inlet. Winds are blowing out of the South-Southeast at 15 mph, gusting to 21 and there is a moderate chop on the water. We have a chance of showers this morning and a chance of showers and thunderstorms this afternoon. NOAA has a small craft advisory in effect through this afternoon. Tommy Turowski at the Sebastian Inlet Bait and Tackle Shop reports a slower bite…still. He was hoping the inclement weather over the weekend would kick up the bite but only a smattering of different species were landed and none in large numbers. A few Blues, Mackerel, Reds, Snook and Sheepshead were landed for the more patient anglers. Our photo today is courtesy of Susan Jefferson. Susan sent in our featured photo today of her fiancé, Mervin Jones of Vero Beach. 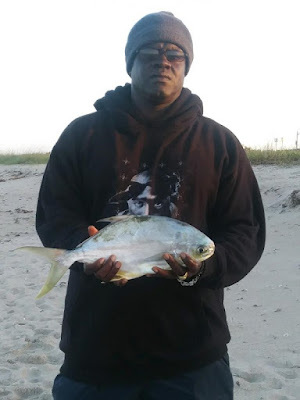 Mervin was fishing the south beach near the jetty when he landed this sweet 16” Pompano. Mervin landed this Pompano, his first, along with an undersized Snook and a couple of undersized Black Drum that were returned to the water. He saw a couple of Reds landed by other anglers.